It was back in September 2012 that a blues band from the north east of England flew across the Atlantic to scoop the coveted ‘New Brunswick Battle of the Blues’ award. Then a four-piece, they returned home to continue to gig in pubs and clubs and at prestigious blues festivals. It’s what is expected of a blues band, fame and riches weren’t about to come their way, so Groove-a-matics kept on keepin’ on. 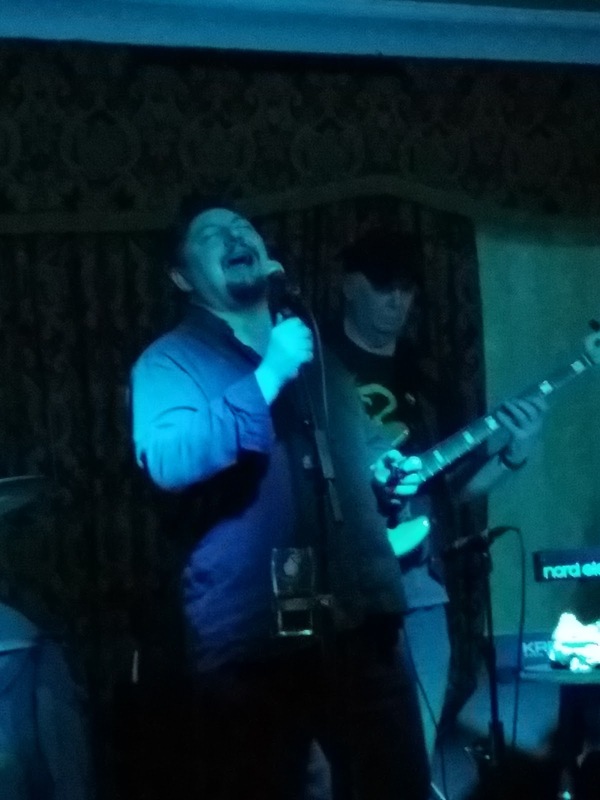 Last night at the Maggie Bank (Magnesia Bank) in North Shields, Groove-a-matics kept on keepin’ on. The now five-piece band – with the addition of keyboards – soundchecked to a loyal following, otherwise, the well-known Camden Street hostelry was very quiet. Bar staff said Saturdays, of late, had been unusually quiet. A ‘lively’ pint of Three Kings’ ‘Billy Mill’ (4%) brewed just along the road, seats were ‘take-your-pick’ with so few in as the best blues band around was ready to go. 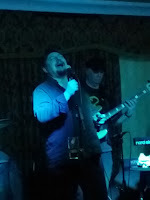 They Call Me Good Time Charlie sang frontman Mick Cantwell. Yes, Bobby ‘Blue’ Bland in North Shields! There is something about a blues band playing a pub gig, playing the music of its largely unrecognised American creators, playing it for the love of it. No reason why bar staff should know who Bobby Bland was, likewise the barfly propping up the bar, or was the bar propping up…? 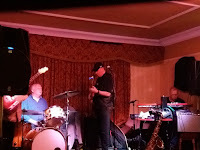 The band – Cantwell, harmonica, jumpin’ tenor sax and a voice to die for, the doyen of blues guitarists, Johnny Whitehill, the bass and drums engine room boys John Morgan and Barry Race and a new, recent recruit on keyboards – played to its audience. It took a little while but an audience did build, the set list seemingly tailored for the occasion…blues and other, non-blues, material. I Can’t Stand the Rain. The blues? No matter, Mick Cantwell was singing, give him the phone book and you’d get the blues. Groove-a-matics write tunes. Mr Green pays homage to Peter Green. The guitar playing of Johnny Whitehill is right out of the British Blues Boom legend’s locker. Close your eyes and it was Green/Whitehill/Green! Cantwell sings of being a ‘working class man’ insisting he’s ‘as good as anybody’…as a bluesman, he’s better than anyone else! Frankie Miller’s A Fool in Love mined a blues-rock seam, and, as the last Metro came down the line, Groove-a-matics went out on Mel London’s Messin’ with the Kid. In six days from now (Friday 27) Groove­-a-matics play Billy Bootleggers. Now then, that’s the place to hear them! Russell mentions the great Peter Green - and the band paid homage to him with a reworking of Need Your Love So Bad, and their rewrite of the lyrics - I want to thank you, Mr Green. Incidentally, B B King rated Peter Green highly - saying his tone was so sweet, his playing could keep him up at night and bring him out in cold sweats ...... or something like that! What an ace gig this was - and I'll be heading down the stairs to Billy Bootleggers on Friday night, that's for sure.